The 2011 Preliminary Results for the Corn Hybrid Trials are available here. The trials include tables for Early, Medium, Late and White hybrids. There are annual, 2-year and three-year summaries for most tests. Be sure to only compare one hybrid to another in a single test. The final report will be coming soon and will be posted to the Corn Hybrid Testing website. The 2011 Kentucky Extension Wheat Yield Contest winners are reported below. The top overall yield was 112.07 bushels per acre reported by Double P Farms in Todd County. The top no-till yield was 107.53 bushels per acre submitted by Duncan Gillum. 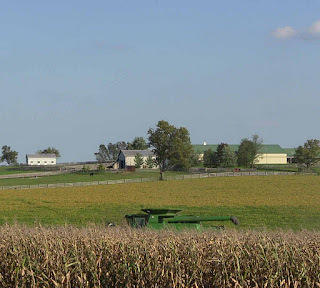 Kentucky grain farmers in some parts of the state have been harvesting corn for a few weeks now and they will soon need to decide how much wheat to plant this fall. In Kentucky, wheat is almost always planted in the fall following harvest on corn ground, and then double-cropped with soybeans in early summer after the wheat harvest. This allows for two crops in one year. However, soybeans planted after the wheat harvest are more susceptible to summer drought, so on average, yields are lower for these double-cropped soybeans. In Kentucky, this yield reduction typically averages around 20%, but in many years there will be no yield difference due to weather. On July 14, 2011 the EPA approved a supplemental label for using of Simazat (a premix of atrazine and simazine) for fall applications to control winter-annual broadleaf weeds prior to next year’s corn crop. The recently approved label is the only one that allows the use of atrazine in the fall in Kentucky. A lot of resources have been invested over a period of several years defending the registration of atrazine. In order to maintain atrazine as a viable option for weed management in Kentucky, it is important that applicators are not complacent in regards to its potential impact on the environment. Label restrictions concerning Simazat’s use near ground and surface waters are particularly important when it is applied in the fall. Highly erodible fields with little to no vegetation, or residue cover, are especially at risk of movement of atrazine or simazine from the treated area. Certain watersheds, including portions of the Green River and Rough River are being monitored for atrazine and simazine. It is also important to consider the rate of atrazine and simazine. The recommended rate for fall applications is 2.5 pt of Simazat 4L/A. This is equivalent to 0.625 lb ai atrazine/A plus 0.625 lb ai simazine/A for a total amount of 1.25 lb ai/A. If Simazat is applied in the fall, do not exceed 2.5 pt Simazat 4L/A preemergence the following spring. When tank mixing or sequentially applying products containing atrazine and/or simazine, the cumulative amount of active ingredient of atrazine and/or simazine per calendar year must not exceed 2.5 lb ai/A. If using the Simazat 90DF formulation, consult label for the maximum use rates.